Being old school is not the worst thing in the world. Even when every single media outlet is trying to push technology down our throats all day 365 days a year. Some jobs just have to still be done the old fashion way. Things like paintings and sculptures have to be able to capture the human element in them. There is nothing better than being able to appreciate an artist’s technique in all of his creations. Maybe I went a little too romantic, but at least for me there is still certain value in being able to take pride in your own work. When it comes to pruning the trees on my property I like to think that I am creating or helping to preserve an art form which is nature. That is why I pick my tools very carefully. Typically I do not like to use the heavy duty tools for my trees since they are not the thickest trees out there and really since I prune them regularly. For me it is about not letting things get out of that way you are not doing a complete overhaul every week. I really think that buying tools that are highly contaminating to take care of my property just doesn’t make sense. That is why I went old school and started looking at the Milliard 6-16 foot Extendable Tree Pruner/Pole Saw with 3-Sided Blade. It is a manual pole saw/pruner that can fill the needs of many guys out there. Especially if you have to handle trees that are not that thick, and instead have many bushy parts and skinny branches there is no reason to go out and get bigger tools. The Milliard 6-16 foot Extendable Tree Pruner/Pole Saw is a lightweight manual product that can cut like many heavy weights. The pruner can open up to 1.25 inches so it can go from leaves to branches rapidly making precise cuts every step of the way. The saw can get it done with the best of them. It is 14 inches long and has all 3 sided teeth to make it an even better cutting machine. It is a durable product that can work great within its limits. Also it is only 5 pounds. The pole saw goes from 6 to 16 feet in length. That means you will never have to get on a ladder again to be able to reach those very high places. Since it is a manual pole saw you don’t have to worry about it getting wobbly at 16 feet. All you need to do is stick any of those 14 inches of 3 sided teeth on a log and start cutting without a problem. Pruning head accommodates branches up to 1.25 inches thick. Extends to 16 feet high to reach new heights in tree trimming and avoid the need to climb a ladder. Sharpened on 3 sides for the smoothest of cuts. 50C carbon pruning blade with non-stick coating for easy maintenance. Fiberglass extension pole for strong and durable lightweight trimming. I praised the product for being light. Since when you are extending at 16 feet the majority of the other pole saws get really heavy. However there are reports that they fiberglass pole has been known to get dents and even break. That can be avoiding taking good care of the pruner. Sometimes the rope on the pruner gets so tight that it can even break the fiberglass pole. If you get dents in the pole from accidentally hitting it against a tree that is a whole other story. Lighter materials are just not as durable as full on steel. So you may have to be a little bit more careful with this product. Another knock is that the extensions on the pole saw fit in so tightly that they then can’t be taken off. I would rather it be difficult to take apart than have a wobbly pole. Even if that meant having to grease the poles up a little bit. Which is actually my recommendation on the extension areas. On the positive side people really praise the saw in the reviews. Also it has a foam handle that allows you to have a softer grip. That way you are not using all your strength to try and cut through. Instead it allows you to adjust the saw and move it smoothly so it does the work. I think this is key for manual saws. Having to input a huge amounts of force for the saws to cut is the main reason people turn to electric or gas powered saws. I can’t stress enough the environmental benefits that this has for your property. No excessive contamination every time that you get a little work done. Plus you save money on gas and can use it any time you want. Honestly the best feature that this pruner/pole saw has is that it is a great price to quality ratio buy! After all that I said I think it is pretty clear where I am leaning with this product. Like I just previously stated for me it really has a great price to quality ratio. However like with any product it is key to keep in mind what your specific needs are. This is not a heavy duty tool. So don’t try and force it to be because you will only end up disappointed. It is a great emergency tool. For those people out there that are only going to use it once in a while its perfect. You can literally use it immediately after taking it out of the box and it will get the job done. Then set it down for the next month and come back to it realizing that its performance has not changed a bit. You can’t do that with a gas powered tool. If you don’t start it for a month you are going to have a hard time doing so the next time you try. If you fit that description of being a beginner in the field of landscaping this is a great tool to start getting your feet wet. If you need a quick fix and have 65 dollars that can also easily be arranged. Don’t just take my word for it. Go and see what other people had to say about the Milliard 6-16 foot Extendable Tree Pruner/Pole Saw with 3-Sided Blade on amazon. Reach Hard-To-Get Limbs In Less Time! 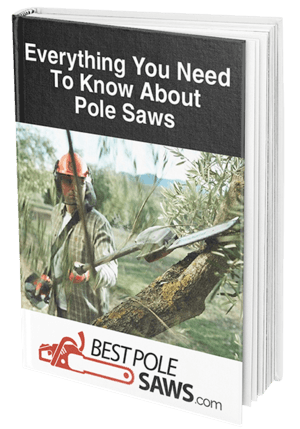 Download our FREE eBook guide and learn how pole saw can help you put less stress on your body and reach hard to get areas!